4 Dimension Omega-3 Plus delivers ultra-pure omega-3’s, which can help hard training athletes and bodybuilders in a number of ways. Omega-3’s have been shown to support the body’s natural lypolytic fat breakdown and switch off lipogenic actions that cause fat storage. * Omega-3’s also help support a healthy inflammation response in muscles and joints after hard training. * Furthermore, the omega-3’s found in 4 Dimension Omega-3 Plus can help boost mental focus for intense workouts! * 4 Dimension Omega-3 Plus is made up exclusively from premium, omega-3 sources including sardine, mackerel and anchovy instead of less concentrated and often largely impure fish sources like salmon. The Omega-3 Plus rapid-release softgels are purified to eliminate mercury, and other heavy metal contaminants. Don’t settle for anything less than the highest quality fish oil - 4 Dimension Omega-3 Plus contains highly concentrated and purified Omega Fish Oil for enhanced potency and better absorption. * The result, 4 Dimension Omega-3 Plus is a truly superior product that meets or exceeds the strictest standards in the world!. 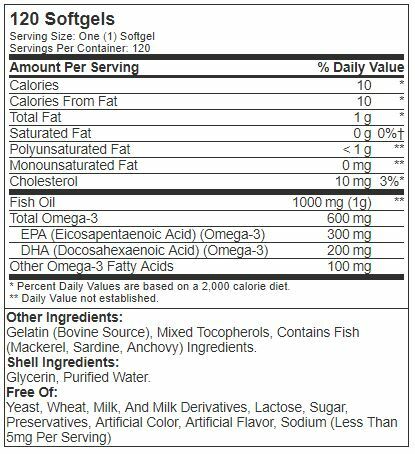 Directions For Omega-3 Plus: Adults, take one (1) softgel up to four times daily, preferably with a meal.